Alongside the concerto is something a little more rarified, the music from Comus. This was written for private performance at the home of the Earl of Gainsborough in 1745, but the text extols the virtues of an Arcadian idyll in just the way that Vauxhall was described, and in fact there was at one time a Temple of Comus there. There is two further Handel items, a short hornpipe which was written for Vauxhall and the patriotic song, written in 1746 after the Duke of Cumberland's victory of Bonnie Prince Charlie, the rather cumbersomely named A song on the Victory Obtain's over the Rebels by his Royal Highness the Duke of Cumberland or From scourging rebellion. 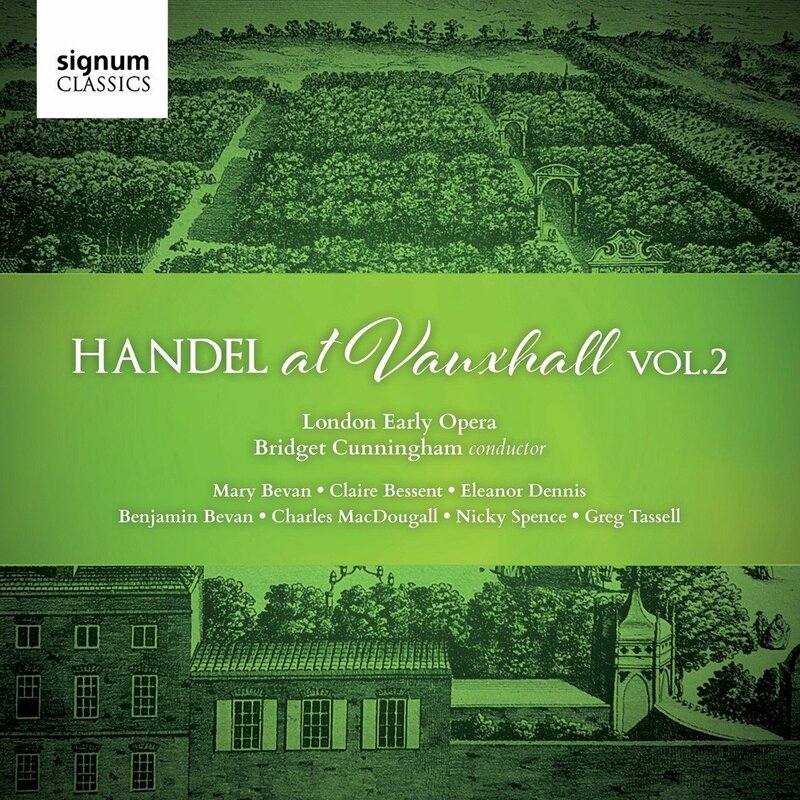 The programme opens with William Boyce's Spring Gardens (Rural Beauty or Vaux-Hal Gardens) sung by Greg Tassell, a song extolling the virtues of Vauxhall, a genre which was popular at the concerts. Here we also have Colin's Description of Vauxhall or Green-Wood Hall by Thomas Gladwin; at eight minutes long this takes all of Nicky Spence's story-telling skill to hold the attention in what is a basic strophic song. Other songs in the genre include Lampe's Farewell to Vaux Hall sung again by Greg Tassell, and Thomas Gladwin's The Ladies in Vaux-Hall Gardens to the British Officers at Dettingen (sung by Eleanor Dennis) which combines Arcadian description with patriotic sentiment! Songs of a more general character include John Stanley's The Power of Music and Beauty (sung by Mary Bevan) and Roger and Sue a ballad to a Favourite Air by Sig.r Hasse (sung by Nicky Spence) which combines an English comic text with an aria originally from Hasse's Cleofide. Italian opera itself was a genre almost entirely absent from Vauxhall, clearly the temperament of the entertainment with its emphasis on British composers was antithetic to Opera Seria. The last item on the disc is great fun. A Loyal Song (sung by Charles MacDougall and Benjamin Bevan) is a lively, early version of the National Anthem. The CD booklet includes an admirable background article from David Coke (author of Vauxhall Gardens: A history) along with background to the music by Bridget Cunningham. This is a charming disc, a lovely complement to the first volume, and like that one it takes us into the heart of the music-making at Vauxhall. Never less than charming, the music must have had an added glow for being performed in the open air. Not all the songs are at the same level, and one or two fall into the charmingly interesting category, but overall we get a fine picture of music in the gardens. Bridget Cunningham and her team bring a lively charm and sense of engagement to the music.